Fedora 21 appears with a new vision and some interesting new tools for developers and system administrators. Users, reviewers, and open source insiders have been waiting for the latest release from the Red Hat sponsored Fedora project. Big changes within Red Hat and the recent Fedora.next initiative  have kept the public curious about the next release. Fedora 21 has finally arrived, and we decided to try it out. Overall, the new release leaves a good impression, although the installer still needs some work. Despite all the fanfare and media commentary, Fedora 21 (Figure 1) is ultimately another Linux release, with some interesting new tools, bug fixes, and a few new technologies that are still experimental but hold promise for the future. Figure 1: Fedora 21 ships with Gnome 3.14.2 as the default desktop. Splitting the products into separate working groups will allow the workstation, server, and cloud editions to develop and pursue a separate long-term visions. Perhaps the most important development is the acknowledgment that cloud computing is distinct from the classic server and workstation paradigm. The Base and Environment/Stack groups will plan and guide the evolution of underlying components that will serve as building blocks for the three editions. A coherent and well-documented plan for building the base components will ensure that the applications and technologies added by the other groups will stay in sync with system internals. The role of the free Fedora project has been difficult to define since the beginning. Red Hat launched Fedora in 2003, around the time they were phasing out the old Red Hat Linux series and phasing in the amped up and corporate-ready Red Hat Enterprise Linux. Launching Fedora allowed Red Hat to continue its legacy of support for free Linux (you gotta pay for RHEL). At the same time, Fedora gave Red Hat a test bed for trying out new technologies that would one day be part of its enterprise products. Fedora also allowed Red Hat to continue to exert influence on the community distro scene, offering an alternative to the otherwise-dominant Debian package technologies used with Ubuntu, Mint, Knoppix, and others. One recent development that has further complicated the role of Fedora is Red Hat's acquisition of the free CentOS project. With CentOS, Red Hat adds a second free distro to the lineup – and one that is actually a clone of the higher-end RHEL. Still, Red Hat insists it sees a bright future for Fedora. The ongoing Fedora.next initiative is an attempt to map a future for the Fedora project. One outcome of the Fedora.next process is the decision to produce a cloud version of Fedora (see the box titled "Fedora.next"). Fedora 21  is the first release that reflects the principles of the Fedora.next proceedings. The Fedora 21 release comes in three flavors: in addition to a workstation and a server version, you will find a cloud offshoot for installation on Amazon's AWS or hosting in a personal cloud environment. All three Fedora versions are available on the project website for 32- and 64-bit systems. Each edition is based on kernel 3.17, the distribution's own installer, Anaconda, and the systemd init service. Along with the three main Fedora versions are several Fedora Spins , with different desktop environments and their own selections of preinstalled programs. No less than 21 spins are available, including spins with the KDE, Mate, XFCE, and LXDE desktops. Specially adapted spins are also available for designers and musicians, security auditors, and robotics programmers. The core of Fedora 21 is Linux kernel 3.17 (released in October); the packages were compiled with GCC 4.9.2. Systemd is actively used: Among the many services controlled by the controversial new init system are the getty terminal manager and the SSH firewall daemons. After a minor revamp, the Anaconda installer now offers more partitioning details on the overview page. The hard disk partitioning tool, however, is likely to cause confusion for newcomers. To use an existing partition for Fedora, you must first delete and then re-create the partition. A Done button also irritates, distracting from the fact that more steps might be needed with the convoluted configuration tool (Figures 2). If you click on the button at the wrong time, you usually end up back in the overview, with the message that you have not selected any installation media. Figure 2: Anaconda's Partition Manager is still not entirely convincing in Fedora 21. By default, Fedora sets up a boot partition with Ext4. The system also ends up on an Ext4-formatted LVM volume. You need to select manual partitioning for Anaconda to configure Btrfs as a filesystem. In addition, Fedora sets up the language and time zone settings based on your IP address. While the installer is installing the first packets, it prompts you for the root password and lets you set up the first user. 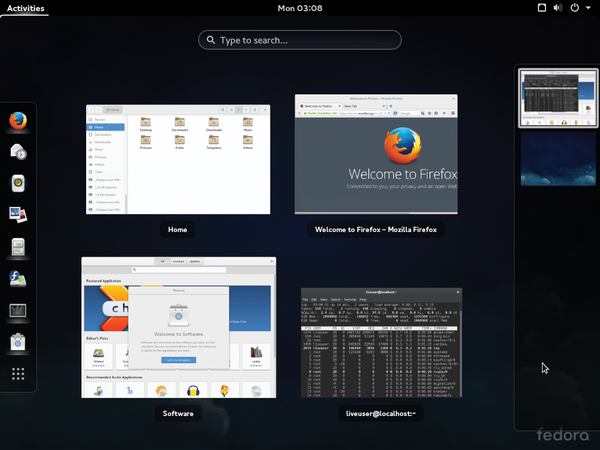 Fedora 21 uses Gnome 3.14.2 as its standard desktop. The developers have enhanced Gnome with gesture control and optimizations for HD displays. You can optionally use the designated X.org successor, Wayland. The installation routine dumps the package required for using Wayland, gnome-session-wayland-session, on the hard disk by default. On the login screen, you can then start Gnome with the alternative display manager. In test mode on a laptop with Intel's Sandy Bridge platform, the desktop ran smoothly under Wayland without significant limitations. From time to time, however, the mouse pointer jumped or disappeared behind a window. The developers also stress they need to put in huge amounts of work  to complete the transition to Wayland. Many applications still use the Xwayland wrapper; Wayland will not become the standard until Fedora 23. After installing the workstation version, Gnome again prompts you to choose a language and offers to set up various Internet services, including Twitter, Facebook, and Google. The targeted packet selection for the three new distributions is evident, among other things, from the fact that the workstation edition lacks administrative tools for firewall and network settings: The software included with the workstation edition clearly focuses on daily work. Fedora 21 Workstation accordingly sets up the current versions of LibreOffice, 4.3.4.1, and Firefox 34. As its graphic add-on for package management, Fedora uses the built-in Gnome software tool. The front end now shows thumbnails of the listed packages, thus giving users a better overview, and handles pending system updates – at least in theory. In practice, however, the tool reported that the installed software was up to date, although numerous updates were available for uploading via Yum. Fedora 22 was released a week late, but it is seriously impressive with Gnome 3.16 and the new DNF package manager. Only the installer, Anaconda, might cause beginners a headache. Red Hat's community distro embraces the cloud. The workstation comes with the latest Gnome desktop environment and support for many application build systems.